There are two primary sources of financial aid: The University and the Department of Kinesiology. 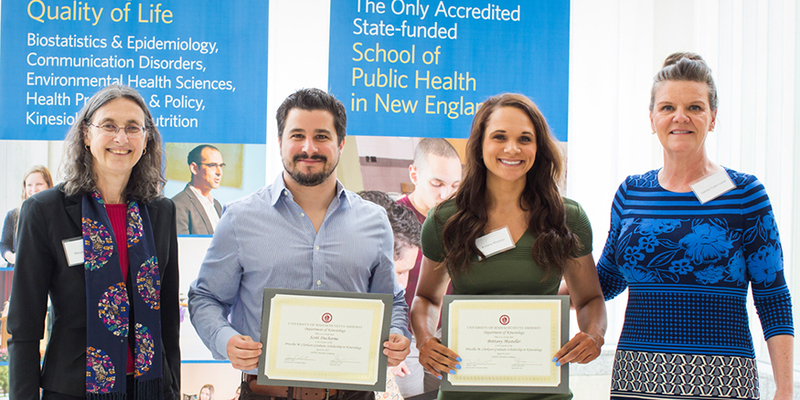 In addition to graduate assistantships offered through the department, a limited number of fellowships are available through the School of Public Health and Health Sciences and through the Graduate School on a competitive basis. The University offers a variety of opportunities for undergraduate students to receive financial aid and scholarships. For further information on financial aid available to undergraduate students, including federal student loans and grant programs, visit the UMass Amherst Financial Aid Services website. Teaching and research assistantships are available on a competitive basis. Each assistantship includes a stipend, tuition waiver, and health-fee waiver, as well as a waiver of some student fees. In addition to graduate assistantships offered through the department, a limited number of fellowships are available on a competitive basis through the School of Public Health and Health Sciences and through the Graduate School on a competitive basis. For additional information regarding financial aid or funding opportunities available to graduate students, call 413-577-0555, or visit the UMass Amherst Financial Aid Services website. The Patty S. Freedson Undergraduate Scholarship was created to provide financial support for an undergraduate Junior in the Department of Kinesiology. The scholarship is awarded annually to a student who has a minimum GPA of 3.0 and demonstrates an interest in entering the field of corporate health and wellness. The Dr. Frank Rife Kinesiology Opportunity Scholarship supports students in their efforts to gain life, academic, and outreach experience. Funds may be used to support expenses for both domestic and international internship opportunities (e.g., tuition, travel, cost of living, etc.). Kinesiology majors, with a 3.2 GPA or higher, are eligible to apply. Professional and academic experience will be considered. The Rouzier Family Pre-Health Professional Scholarship supports rising upperclassmen with an interest in the health care field. Preference for qualifications would include first generation college students, financial need, athletic interest, and an interest in using exercise as preventive medicine. The Eric Sinacori Memorial Scholarship is awarded annually to a student who is a rising sophomore, junior, or senior who has a minimum GPA of 3.0 and demonstrates financial need as determined by the Financial Aid Office. Students who apply must demonstrate how they intend to use their degree in Kinesiology to better the lives of others. The Priscilla M. Clarkson Fellowship is eligible to students pursuing graduate degrees in Kinesiology. The fellowship provides financial backing for promising scholars and enables them to pursue research and opportunities that will expand their professional horizons. The School of Public Health and Health Sciences has implemented an exciting and convenient new system, AcademicWorks, which automatically matches you with the scholarships and financial awards you’re eligible for. These include scholarships and financial awards offered through SPHHS, Commonwealth Honors College, the Alumni Association, financial aid, and your major department. By spring 2019, all scholarships offered at UMass will be in the AcademicWorks Platform. Simply enroll in AcademicWorks, fill out both the UMass general application and the SPHHS Application to get started. These include funding for internships, study abroad, financial need, and research. Visit the AcademicWorks website now!